There’s plenty more to explore though, including the prominent feature of the circular Record Tower which dates back to 1226. Emphasising the range of ages of buildings here, the chapel bolted on to it was completed in 1814. All in all, it’s a fascinating journey through time and we loved it. It’s also worth popping into the Garda Police Museum which is located here to see some of the artefacts from policing over the years and read more about the history of the police in Ireland. 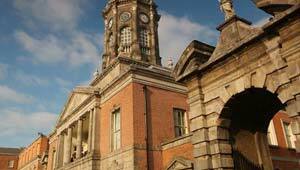 Dublin Castle is open to the public Monday to Saturday 10am to 4.45pm and Sunday 12pm to 4.45pm. Access to the State Apartments and Medievel Undercroft is by guided tour only. Adult tours cost 4.50 Euros although there is free access to the castle on the first Wednesday of every month (2011 prices). The Garda Police Museum is free of charge. Dublin Castle is just off Dame Street.